When looking at the collection at Lachford Hall, it is easy to focus on the many large pieces of furniture, but there are also many small items of great interest including two pieces of folk art displayed on a fireplace mantel originating from the Painter generation. Both pieces hold unmistakable similarities, yet they also have predominant differences that raise a number of questions. The illustrations are ink and watercolor on paper, materials which were easily accessible at the time of origin. 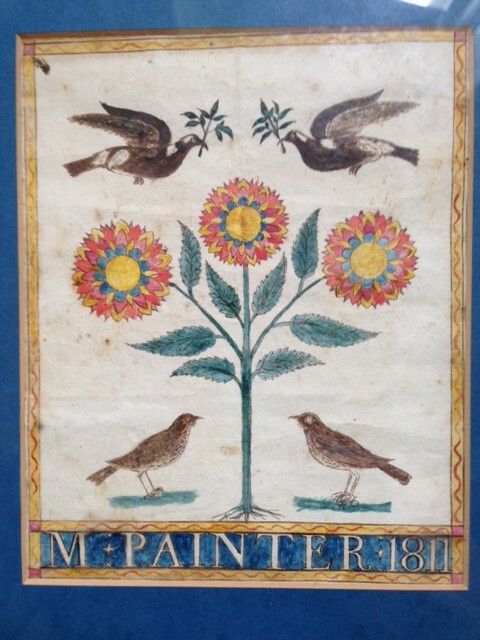 The first illustration is a freehand, naturalistic motif that displays an image of a flowering plant and birds. At the bottom of the piece there is an inscription band which reads “M. Painter 1811” that clearly identifies the piece with the Painter Family. 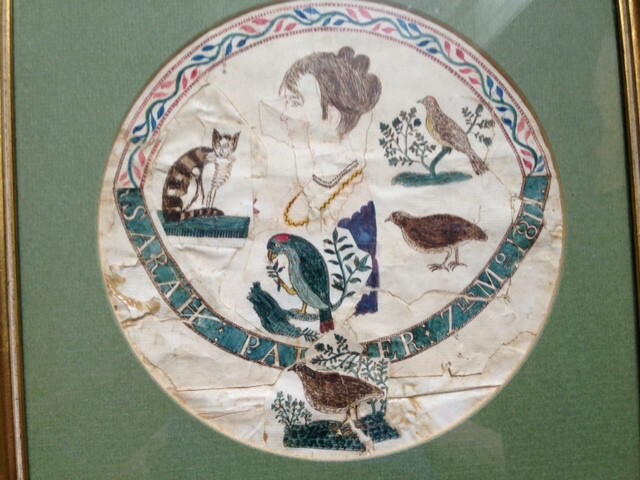 The other piece is also a freehand illustration created with ink and watercolor that depicts the profile of young woman, a cat and birds. Similarly, this illustration has an inscription band which appears to read “Sarah Painter 1811,” although there is a small motif that partially obstructs the band. The parallels that can be drawn between the two pieces are substantial. Primarily, the birds depicted in each illustration appear to be of the same hand and variety. Additionally, the inscription bands also share the same appearance and are both dated 1811. There is a great mystery within these illustrations and many theories attempt to answer the unknown. The first explanation, which is also supported by Tyler’s catalog entries, is that Minshall Painter created the naturalistic painting, and Sarah Painter created the profile piece. This theory assumes that the inscription bands chiefly distinguish the artists. However, some difficulties arise with this belief. In 1811, Minshall Painter would have only been 10 years old and Sarah Painter would have only been 7 years old. The work seems to be a bit too sophisticated to be created by a 10- and 7-year-old. Another theory is that Minshall Painter illustrated both pieces. Yet, the question of artistic ability at such a young age develop with this theory as well. Again, the paintings are naïve, but well-executed and may be too complex to have been created by a 10-year-old Minshall. Also, the profile illustration seems to be of a young woman, not a 7-year-old Sarah Painter. The last theory is that an itinerant painter was hired and painted both pieces. Itinerant painters were commonly known to travel from door-to-door offering their services of painting portraits, animals and naturalistic scenes for a small fee in this time period. But there is coloring on both the illustrations that could have been done by a neat child that was supervised by an adult. And on the Sarah illustration there are two animals that have been cut out and pasted rather amateurishly over work underneath that probably was deemed sloppy by someone. Whichever theory is true, the two pieces add great visual interest to the many unsolved mysteries and unanswered questions in the history of the collection at Tyler Arboretum.